He is supposedly back on with his 'princess' Selena Gomez after the pair were spotted enjoying several dates last week. But Justin Bieber appears to be keeping his options firmly open. 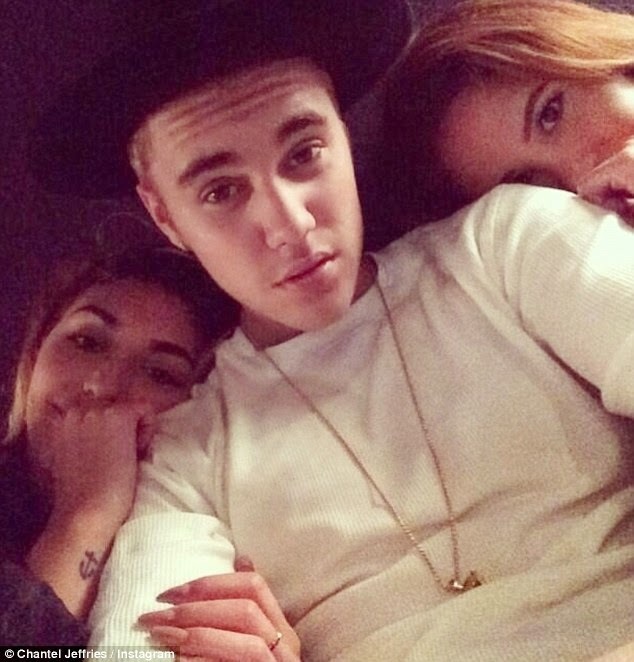 The Baby star was caught cozying up with not one but three pretty ladies - including model Chantel Jeffries and her friend Catherine Paiz - over the weekend. Justin Bieber Puts His Arm Around Pretty Woman At Skate Jam Just Days After Partying With GF Selena Gomez from Dailybuzz.ch on Vimeo. The 20-year-old singer was not shy with his affections as he got close to a pretty brunette at pal Chris Brown's 1st Annual Skate Jam Party in Glendale on Sunday evening. His cute companion, who was on roller skates, showed off her shapely legs in a tight pair of white shorts and cropped T-shirt. And Justin looked very attentive as he wrapped an arm around her shoulders and whispered in her ear. At one point the crooner appeared to take her phone number as he leaned in to listen very carefully to the young woman while holding his phone in his hand. And the raven haired beauty is not the only company Justin has been keeping over the last few days. On Thursday his partner in crime from earlier this year - model Chantel - was seen leaving the Boyfriend singer's house in Beverly Hills. And it seems that the 21-year-old brunette was not shy in flaunting her rendezvous with the star as she posted a very cozy looking Instagram snap in the early hours of Monday morning. In the shot, she snuggles up to the heartthrob and looks coyly up at the camera. Her best friend Catherine lies on his other side, forming a veritable Justin Bieber sandwich. And the pop star didn't appear to mind being wedged in-between the two beauties as he looked intently up at the camera. Chantel, who once dated former Eagles receiver DeSean Jackson, was seen leaving his residence in an all-black ensemble including black boots and a leather jacket. And Catherine followed closely behind her in an almost identical outfit. Shortly afterwards Justin's friend Lil Za was also seen heading out. Meanwhile, Justin and Selena have been seen on a string of dates together over the last couple of weeks. On June 20 the pair enjoyed dinner and a movie but finished it off with something a little bit different. 'Jelena', as they are affectionately called by their fanbase, were spotted at a Los Angeles studio later that night, making it seem as if their romantic reunion may lead to a musical collaboration. Justin, 20, and Selena have had a tumultuous relationship over the past four years, breaking up and getting back together so many times that fans can't keep up. But right now things appear to be on for the duo, who have been inseparable for the past week. For their studio date Justin wore a hooded white top and jeans, along with a hat and Selena opted for a fringed black cardigan and jeans. 'It is always on and off. Same story, every other week, every year. Now they are together again, next week they won't be,' the insider spilled rather pessimistically. Though they added: 'They never stop talking, even when you don't see them together - that never changes.